I am currently writing this on my week away with my family. Every year we hire a place called the Saddlery in Titchwell take all the dogs and it's basically a beach bum week. It's been a tradition for a good 9 years now and we keep coming back. One of the perks (apart from the beaches) is the amazing sea food that you get, fresh straight from the Norfolk coast. My uncle is a head chef so cooks amazing food whilst we stay but once or twice during the week we do go out for a lovely family meal. Last night was Briarfields (which no joke is opposite our house). We have been there a few times before but this time we managed to sit outside because of the beautiful weather. Even at 8pm it was still glorious sunshine so of course we ordered lots of white wine and some cocktails. I am used to London prices so thought they would be super expensive but I got a very minty mojito for £4.50. That is a price that I cannot say no to. Mom settled for a on-alcoholic strawberry lemonade. which was made with pure strawberry pieces. It was so refreshing to have a crisp drink. I have been to Briarfields a few times before in previous years in going up to Norfolk as we normally stay in a tiny village called Titchwell and Briarfields happens to be on the doorstep. 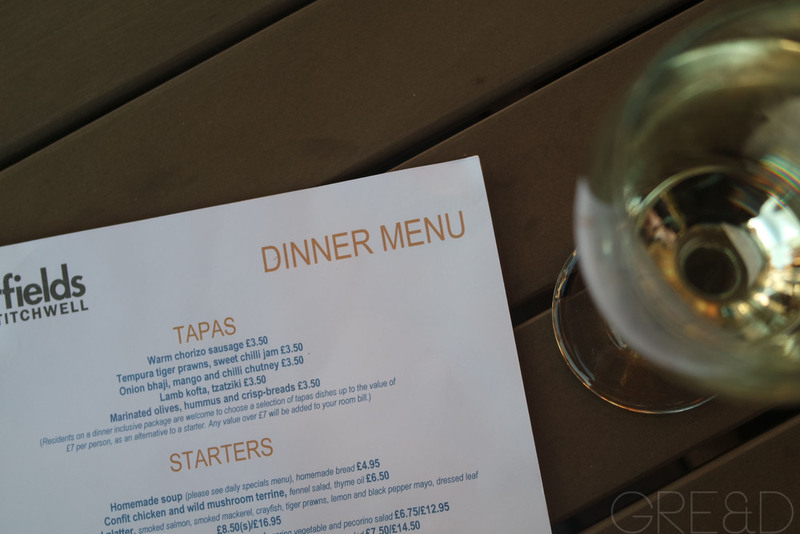 This year they had slightly changed the menu and as well as starters there is the option of tapas which a few of us ordered. Myself, I chose Tempura king Prawns with Sweet Chilli Jam. My Mom and some of my cousins ordered other tapas bits too, including olives and hummus and lamb kofte. However when they came out, a few arrived on a wooden board which made it a little difficult to eat off of, so we ended up just removing them from the board. The prawns were amazing though. They were so fat and juicy and went so well with the sweet chilli jam. Whenever I am up in Norfolk I always take advantage that I can eat very fresh seafood as it's normally been caught that day or the day before. For main I chose the Brancaster Crab risotto. This was a starter option but I chose to have it a little bigger and more my main (I'm always awkward like that!) A lot of my family ordered Fish & Chips; a classic and always comes the size of a small whale. Two of my cousins, Harry and Edward ordered Pan Fried Hake and Poached Salmon which all looked and tasted super yum as I had to have a bite of everyones! My crab risotto was nice but it was overpowered with parmesan which was a bit of a shame as I love the taste of crab. It was more towards the centre that I really got the overall taste. It was still filling and did taste nice but it wasn't what I fully wanted. I also know that we were a large party of 10 but the service wasn't amazing and the main restaurant was empty so it would have been nice to be a little more attentive. However the staff were friendly. To end on a good note, I think that their winning dish is the Fish and Chips as in Norfolk they just know how to do it right.